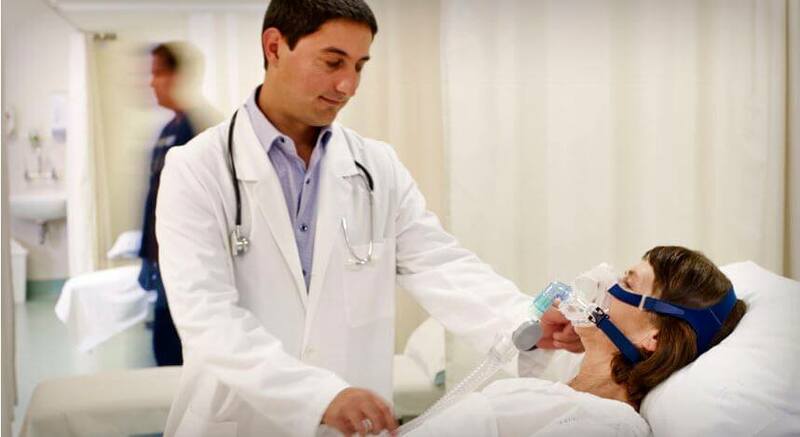 Some ResMed ventilators also feature NIV+ trigger technology that’s sensitive enough that it can detect even the weakest breath, triggering the ventilator to deliver the next breath for the patient so that breathing isn’t delayed. Chest wall disorders are progressive and may require ventilator settings to be adjusted, based on how the patient’s condition changes. ResMed’s range of ventilators caters to patients who are non-dependent right through to those who are dependent on ventilation. For extra versatility, ResMed ventilators offer both noninvasive and invasive options. ResMed’s advanced data collection capabilities (device and card data storage with high-resolution flow and pressure data, I:E ratio, synchronisation details, oximetry) and ResScan™software provide clinicians with detailed data for troubleshooting and monitoring patient progress. ResMed’s VSync algorithm ensures synchronisation when there is changing, and occasionally, large leak. ResMed has developed highly effective integrated humidification systems for VPAP™, Stellar™, Elisée and Astral devices. H5i™ heated humidifier and Climate Control – the latest solutions for ResMed’s VPAP range (on the S9™ platform) – can deliver temperature and humidity-controlled therapy to patients, increasing comfort and compliance. H4i is the dedicated humidifier for Stellar ventilators. ResMed’s Ti Control allows clinicians to set a minimum value for time spent in inspiration (available in the VPAP S, VPAP ST, Stellar 100 and Stellar 150).